Muhabura or Muhavura volcano is the third highest peak and the steepest among the 8 volcanoes of the Virunga massif region. Located at the rim of Uganda and Rwanda, mount Muhabura lies party in the Volcanoes national park of Rwanda and Mgahinga national park of Uganda. The mountain summit is beautiful but you cannot be able to view the rest of other volcanoes because of the cloud cover. -Sabinyo is the second tall to Muhavura, it has an elevation of 3,645 meters above sea level, the volcano is quite challenging than the others because of the ragged slopes hence hikers need to be physically fit. The climb takes about 8 hours round trip climbing and coming back to the lodge. The interesting thing about the hike is a chance to step your foot at one stand point in all the three countries of Uganda, Rwanda and the Democratic republic of Congo. Nyiragongo volcano together with Nyamulagira all in the (wester group) are situated within the rift valley floor and are at their most active stage. -Mount Nyamuragira is an active volcano found in the Virunga mountains national park in the Democratic Republic of CONGO. Described one of Africa’s most active volcano is situated about 25 km north of Goma town and Lake Kivu in the Virunga volcanic province. It’s recorded that the volcano has erupted more than 40 times with the most recent volcanic eruptions occurring in 2010 and 2011. The active volcanic mountain covers an area of about 1,500 sq km which is found within the western branch of the great east African rift valley. Because of the active lava activity on the volcano, it has attracted many travelers who come to witness the natural volcanic eruptions offering yet amazing volcano hiking opportunities through the Virunga rain forests that harbor the two great apes that are the mountain gorillas and the chimpanzee. The broad shield volcano stands at an altitude of about 3,058 meters above sea level with hiking possibilities to stand on top of the 2 km wide caldera lake with steep walls of over 100 meters. Due to its frequent eruptions that produced a 400 meter high column of lava which resulted into formation of a 500 meter deep lava lake on top of the summit and emplacement of parasitic cones, new smaller volcanoes on the flanks of Nyamuragira volcano. The erupting volcano has helped to attract many tourists into the DRC boasting tourism on top of the critically endangered mountain gorillas as a result tourists who come to see gorillas end up hiking the volcano to spend an overnight looking down into the molten lava lake. Hikers come for volcano viewing with spectacular sights. In 2010 and 2011 when the recent eruptions took place, many travelers found their ways in the Democratic Republic of Congo. Despite Eastern DRC used to be feared due to past civil wars and rebel activities over the past 10 years; however with the increase in security by the deployment of UN peace keeping forces and the DRC government, the region is safe for tourists who are always protected by armed rangers. Nyamuragira rises above Africa’s oldest rain forests with unique vegetation and ecosystems making it the most biologically diverse region. Ranging from savannahs, boggy swamps, bamboo forests, lava plains, woodland forests, alpine and snow capped mountains of the Rwenzori in eastern side of the region. These habitats are a home to the last surviving population of mountain gorillas about 880 gorillas divided between bwindi and Mgahinga national parks in south western Uganda where half (400) of the gorillas live, volcanoes national park in Rwanda and the Virunga mountains national park in DRC. Other Wildlife which includes forest elephants, chimpanzees, species of primates, birds, antelopes also live in the forests which compliment the volcano viewing. Nyamuragira can be hiked during day with the help of guides, armed rangers, and porters the trek can only take 3- 4 hours. For overnight trekkers to Nyamuragira, there are bungalows built with lava rock walls and thatched roofs at USD 300 per night per visitor. Normally, you would also want to camp, its advisable to come with your own tents, camping and hiking gears. Trekkers must be equipped with solid walking shoes, walking sticks, sun hut and screen, rain jackets, bags, a pair of warm clothing to prepare for the showers at any time of the day. Packed foods or snacks and drinking water are essential. The weather is pleasant all year round but the best time to hike is between Januarys, July and august with short and long dry periods. June and September are good for hiking as well. Weather is unpredictable because of the equatorial climate hence expect some showers. Hikers are advised to take preventive medicines against yellow fever, malaria and acute mountain sickness before attempting to climb. Nyamuragira can easily be reached by public transport, from Kigali it takes 2 hours to Goma town in DRC and then continue north of Lake Kivu to the starting point. A hiking tour to Nyiragongo starts from Rwanda driving through Gesenyi crossing to Goma town via the Rubavu-Goma border. Its approximately 30 minutes from Goma to the mount Nyiragongo trail head at Kibati village patro post. Briefing at the trail head starts by 9:00 AM. The hike up Nyiragongo takes about five – six hours though very dependent on the fitness of the entire group, its exhausting since your climbing at high altitudes and gets hotter an you climb up with a path that isn’t so steep and rough. The climb up the Nyiragongo offers you views of quite a number of bird species, small mammals and vegetation. The night will be spent in tents on the rim of the giant crater, high above the active lava lake. 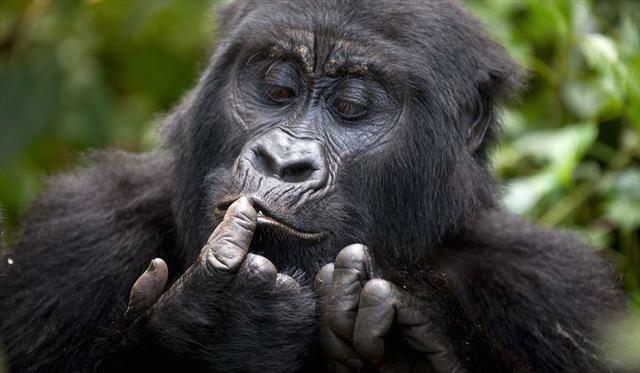 Mgahinga Gorilla National Park is the smallest Ugandan national park created in 1991. Located south west of Uganda in Kisoro town, the park comprises of the Ugandan section of the Virunga massif region bordering Parc National des Virunga of the Democratic Republic of Congo and Rwanda Parc National des Volcans. settled by Bufumbira people and Batwa pygmies who were inhabitants of this forest before it was turned into a national park. Mgahinga National park has one group of habituated mountain gorillas which in the past used to cross over to Rwanda or Democratic Republic of Congo but has since settled in Mgahinga national park. Gorilla trekking is the primary activity in the park although one can also trek to see the Golden monkeys which are also restricted to the Albertine rift region. The park is located at the extreme corner of south western Uganda on Rwanda and DR Congo borders and is Uganda’s smallest national park covering an area of 34 sq km. the journey to the park covers about 482 km by road or one can fly from Entebbe to the nearby airfield of Kihihi where transportation can be arranged to the park. Given the mountainous and high altitude of the park, trekking can be difficult but the tough climbs to the top of the volcanoes offers stunning back drop views of the glaciated Rwenzori Mountains. The park is home to the Nyakagezi habituated gorilla group which used to migrate through Virunga national park and the Volcanoes national park but today has settled in the Mgahinga montane forest. Gorilla permits to go watch this gorilla group can be purchased from the Uganda Wildlife Authority (UWA) , or from the park headquarters in Kisoro which need to be booked at least two days to do day. A visit to the Batwa pygmies provides a rich cultural experience ,The Batwa originally used to leave in the Mgahinga forest before they were evicted by the government to turn the forest into a national park.